Ray Konopka from Raize Software, Inc. has released a new component suite called Radiant Shapes for Delphi XE7 Firemonkey. It contains 35 different shape components which you can use in your Android, IOS, Windows, and OSX apps. In addition to all of the shapes that are available you can customize them in the IDE with all kinds of different options. Right clicking on the shapw allows you to choose different fills and strokes for that individual shape. What this means is that you can easily skin each shape to look exactly how you want. Plus you can combine multiple shapes into new shapes. Additionally the shapes automatically scale without losing fidelity like vector shapes. The shapes would also work great in games. There are all kinds of shapes here from a map marker to a shield to a gear to a stop sign and many many more. I can see using these shapes in a lot of applications to spruce them up quickly. 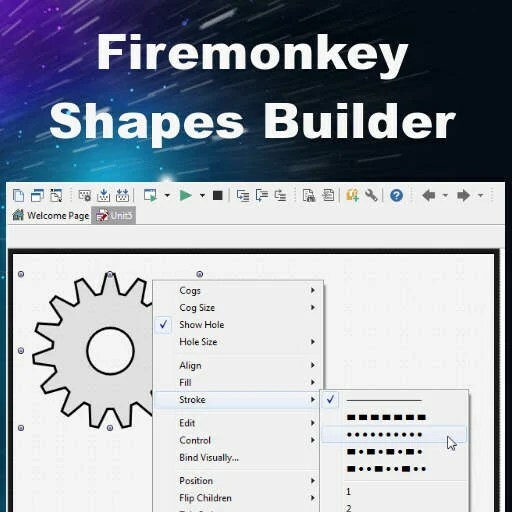 Firemonkey allows objects to contain other objects so you can easily add a shape to a button and just align it to the left or right to get an instant speedbutton style graphic. Here is the full list of components: TRadiantLine, TRadiantArc, TRadiantRectangle, TRadiantSquare, TRadiantFrame, TRadiantCapsule, TRadiantEllipse, TRadiantCircle, TRadiantRing, TRadiantSector, TRadiantSectorRing, TRadiantNoRing, TRadiantTriangle, TRadiantAlertTriangle, TRadiantDiamond, TRadiantTrapezoid, TRadiantParallelogram, TRadiantPentagon, TRadiantHexagon, TRadiantOctagon, TRadiantArrow, TRadiantPointer, TRadiantChevron, TRadiantChevronArrow, TRadiantCheck, TRadiantX, TRadiantPlus, TRadiantMinus,TRadiantMarker, TRadiantTag, TRadiantBanner, TRadiantStar, TRadiantCallout, TRadiantGear, and TRadiantShield. This is a commercial component suite but there are demos available. It also works with Appmethod. Head over and check out all of the different features in Radiant Shapes for Delphi XE7 Firemonkey.